Today, Livorno is known for the fortified town walls and for the small streets. Many foreigners moved to Livorno such as Jews, Armenians, Greeks, Dutch, and English. Some Moriscos (Muslim Spaniards forced to turn Catholic), much later, also moved to Livorno (from Spain and during the 18th century). Bridges, houses and streets, mostly from the neo-classical era are in the district of Livorno. The "Monumento dei quattro mori" ("Monument of the Four Turks"), dedicated to Grand Duke Ferdinando I de' Medici of Tuscany, is one of the most important monuments of Livorno. 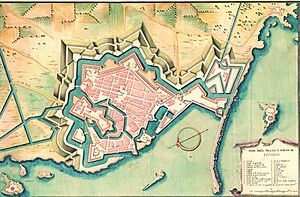 Another important monument is the old fortress which has 3 bastions called “Capitana”, “Ampolletta” and “Canaviglia”. It was made before the Renaissance. Politically, Livorno is one of the most left-leaning cities of Italy. The Communist Party of Italy was founded in Livorno on 21 January 1921. Tuaca liqueur is produced in Livorno. The city also has a petrochemical industry. Livorno has a football team in Serie A, A.S. Livorno Calcio. Livorno inhabitants speak a Tuscan dialect of Italian, called vernacolo. 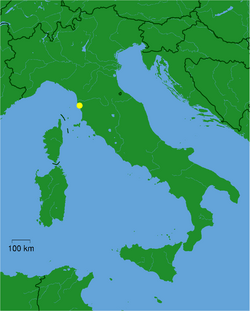 Livorno has a hot-summer Mediterranean climate (Csa in the Koeppen climate classification). Bird's-eye view of Livorno in the mid 19th century. Livorno Facts for Kids. Kiddle Encyclopedia.